Community Outreach Wisconsin (COW) is a group of unique cutting-edge programs within the University Center for Excellence in Developmental Disabilities at the Waisman Center, UW-Madison. These programs work extensively with individuals and community teams supporting persons with developmental disabilities. Your support broker has most likely been assisting you to develop a Personal Profile document that includes a summary of the support services you currently receive. This document should be helpful during your enrollment counseling but also when you meet with your Family Care/Partnership Care Manager or IRIS consultant to review and plan your future supports. Your service plan (Family Care/Partnership) or IRIS (service) plan needs to include all the support services you need to accomplish the goals listed in your plan. Services need to be listed in the plan (and authorized) before the provider can be paid and you can use them. 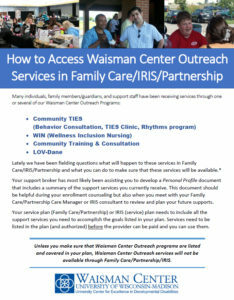 Unless you make sure that Waisman Center Outreach programs are listed and covered in your plan, Waisman Center Outreach services will not be available through Family Care/Partnership/IRIS. At enrollment counseling, inquire what services are covered/possible through the respective programs in Family Care/Partnership/IRIS. . Waisman Center Outreach staff are talking to all the MCOs (Family Care and Partnership) and ICAs (IRIS program) that will be operating in Dane County about making our services available through their programs. Get an even better understanding what specific Waisman Center Outreach services you have been using. Waisman Outreach staff has service data available that lists service hours for 2016 and the first six months of 2017. Ask your TIES/WIN consultant or call our office manager (James Mulder 608-265-9440 ext. 440) to find out how many hours a TIES or WIN consultant has spent with you or provided on your behalf. These numbers can serve as a good starting point for your planning purposes. Once you make your enrollment decision – and you plan to continue using Waisman Center Outreach services – please let us know. Your TIES and/or WIN consultant would be happy to assist you in your planning efforts and explain the services you have been receiving to care managers or IRIS consultants – who might be new to you and/or are less familiar with our services. ** Be aware that the $ amounts listed in your My Support Budget document for Waisman Outreach services are often based on average (!) amounts for all individuals receiving services and might not reflect the actual cost of services – which might be higher or lower. Waisman Center Outreach Programs do not intend to influence a person’s choice re Family Care/IRIS/Partnership. The information provided is hopefully helpful to gain a better understanding of current services and to use this information in future planning.